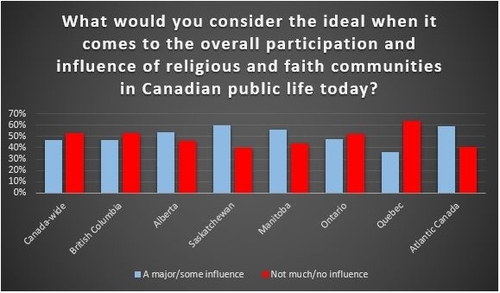 OTTAWA, ON – Canadians are divided almost evenly on the question of how much influence religious and faith communities should have in the country’s public life. A slight majority of 53% of those polled said religious and faith communities should have “not much influence” or “no influence at all.” The rest of the almost 2,000 adults polled (47%) said religious and faith communities should have “some influence” or be “a major influence” on Canadian public life. The Angus Reid Institute poll conducted in partnership with think tank Cardus also found considerable regional differences in outlook, with Western and Atlantic Canada most welcoming of religious voices, while Quebec is most opposed. Meanwhile, Canadians are considerably more likely to say that religious and faith communities make a positive contribution to the country than they are to say that their contribution is negative. While 48% of poll respondents said those communities’ contributions were “a mix of good and bad,” 38% answered that their contributions were “very good” or “more good than bad.” Only 14% of Canadians agreed that religious and faith communities were “more bad than good” or “very bad” for Canada. To see full poll results, please, click here. The Angus Reid Institute conducted an online survey from October 16 – 23, 2017, among a representative randomized sample of 1,972 Canadian adults who are members of the Angus Reid Forum. For comparison purposes only, a probability sample of this size would carry a margin of error of +/- 2.2 percentage points, 19 times out of 20. Discrepancies in or between totals are due to rounding. The survey was conducted in partnership with Faith in Canada 150 (a Cardus project) and paid for jointly by ARI and Faith in Canada 150.